This is my page dedicated to the TV show Cupid - One of the best series that ran on television. It has a lot of fans, despite only running for 14 episodes. NEW - E!Online did a list of the top ten unjustly cancelled tv shows, and Cupid made #4. Take a look here. Or take a look at the entire top ten. I still update the site from time to time. There are more quotes to be added, the episode guide will be overhauled and made as complete as possible. All of these things will take time, so please check back if what you're looking for isn't here. I'll take requests on what kind of information you would like to know. Please use the guestbook or the e-mail link at the bottom of the page. !! !ATTENTION PEOPLE WHO NEED CUPID TAPES!!! Due to numerous e-mail requests, I am now including a link to the Cupid Tape Trading Page. I have a page of "Cupid Quotes" and I would like anyone who has some favorites to submit them. Please e-mail me with yours. The page can be viewed here. The show starred Jeremy Piven as Cupid (aka Trevor Hale), Paula Marshall as Dr. Claire Allen and Jeffrey D. Sams as Champ Terrace. Made it to this page without seeing the show? This is what it's about. Jeremy Piven plays Trevor Hale, a man who claims to be Cupid, the Roman god of love. He says that he was sent by the other gods to match 100 couples before he can return to Mount Olympus. His basis for a good relationship? Heat and passion. Paula Marshall plays Dr. Claire Allen, Trevor's psychiatrist. She runs the singles therapy group that Trevor attends as part of his counseling. She believes that Trevor is delusional. Her basis for a good relationship? A matching list of priorities and common history. Jeffrey D. Sams plays Champ Terrace, Trevor's co-worker and roomate. The theme song is "Human" by the Pretenders. It is available on the latest Pretenders album. Available here are the lyrics to the theme song and a sound clip. Also the songs featured in various episodes are listed. The episode guide is transforming slowly. Each episode will have it's own page containing every bit of info I can get. Work on it is starting to take place. NEW (July 2001): Added the episode guide page for Meat Market. Links devoted to Cupid, and to the stars of the show. The mythology of Cupid and his family can be found here, if you are interested. Also, the story of Cupid and Psyche can be found here. 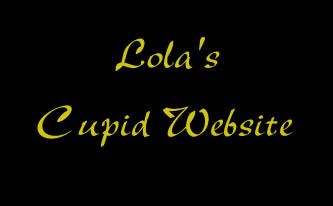 "Roses and a Message for ABC: Don't Play Stupid With Cupid"
"Television:Flight of Cupid Grounded by ABC"
"Some Loyal Viewers Take Cupid's Demise to Heart"
This ABC'S Cupid Fans Webring site is owned by Lola G. Want to join? Many thanks to For Your Eyes Only, Cool Text, and Dana's Gold Designs for many of the grapics used here.